I have had the distinct pleasure of being a Friendly Visitor volunteer for the past several months and am so glad to have been introduced to the Friendly Visitor Program through my volunteer work with Schechter Holocaust Services. Max*, the gentleman I visit, is turning 100 years old in February, although I would guess he was not a day over 80. He is wrinkle free and has a warm and engaging smile. He has glistening blue eyes that twinkle and sparkle with life. Despite his harrowing time in six concentration camps he remains positive and optimistic about life. Max’s mind is incredibly sharp and his memory far better than mine. He is blessed with very good hearing enabling easy verbal communication with him in person and by phone. He stays on top of local and world events by watching TV. He is not shy about offering his opinions even when he and I are clearly on opposite sides of an issue. I appreciate his respectful manner of disagreeing. Although Max’ vision is affected by macular degeneration, together with the help of the Easter Seals Lending Library of Assistive Devices, we were able to identify an over the counter pair of magnifying glasses that have helped him read the newspaper more easily. Max stays in touch with his neighbors, friends, and family by phone. He spends winters in Florida and, during the recent hurricane, he actively checked in with people to be sure that they were safe. He has spoken openly and with deep respect and love for his wife, z’l, and “his boys,” grandchildren, and recently a great grandchild who he met for the first time when the infant was 11 days old. Max, Max’ first great grandson, brings Max great joy. 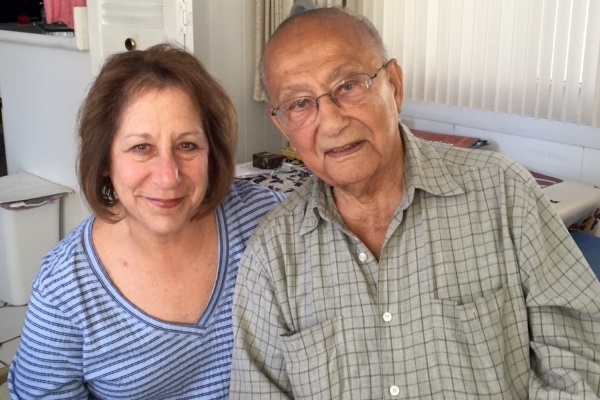 He talks freely of his fond memories of his life in America and knows that he was one of the fortunate to survive his horrible experiences during the Holocaust. He believes that his skill at winning over the concentration camp guards and those with power over him enabled him, at many times, to receive special treatment. I was initially hesitant about becoming a Friendly Visitor because I was not sure if I could help someone who suffered such deep wounds, injustices, and pain in life. Max made me feel comfortable and welcomed me into his home. It became clear that my concerns were unfounded. My visits to West Roxbury on Friday afternoons are truly a delight. My visits with Max are uplifting due in part to his warmth and ability to share his life openly. He remains positive about the future all the while recognizing that each day is a gift for him. I look forward to learning life’s lessons from Max. He is an inspiration to me and serves as a reminder of the resiliency of the spirit under even the most horrific circumstances. I owe Max my deep thanks. Originally posted on the JF&CS blog.